Today’s consumers have little patience for slow loading web pages. The world has become a fast-paced environment and end users expect fast page performance. In a 2006, Akamai did a study and found clients expected a page to load in less than 4 seconds. 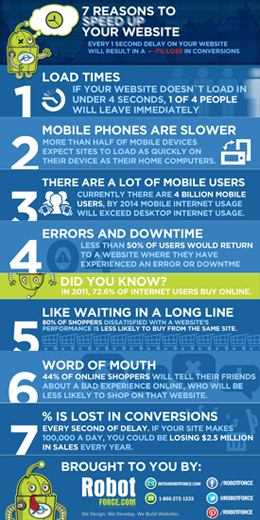 According to a study done in 2009 by Akamai, 47% of customers expect a webpage to load in 2 seconds or less. Customers doubled their expectations in 3 years. It’s clear that these expectations are increasing over time. Analytics applications are a great way for you to analyze data and tell you about traffic your website is getting and locations hits are coming from. This is a great tool to measure your sites traffic; however, some web sites use more than one analytics application and the result is slower loading times. Some search engines have been tracking site speed as part of their ranking for the last two years. They’v found that when they slowed search results down by between 100 and 400 milliseconds, it also slowed the number of searches per user. The results were -.02% to -.06% over a four to six week period. Bloated HTML is another source of slow website speed. This means too much code for the browser to read quickly. Tables are a source of bloated HTML. WYSIWYG editors can also contribute to bloated code. If you are building the code using the visual view, it can create a lot of extra code. Use the code view to do your editing and avoid unnecessary code. Following this rule, you will avoid adding garbage code to your page that will slow it down. Importing Microsoft Word documents converted to HTML can also add bloated HTML by adding extra lines that a browser has to read when it loads a page. Another performance killer is a page that is image heavy and has images that have not been compressed or resized. It is better to resize the image in an image-editing program than to use HTML code to size it using width and height attributes within the HTML code. There have been many studies done that prove that site performance affects the user experience. When it comes down to the revenue you could be losing if your site doesn’t perform well – you should make it your goal to improve your sites performance.